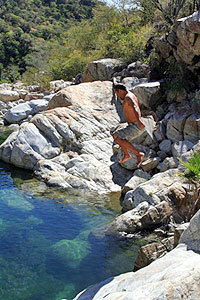 Set off on an epic Jeep tour through the wilds of the Baja, worlds apart from the tourist area of Cabo San Lucas. Climb into your 4x4 Jeep Wrangler and join us on our quest to tame the smattering of off-road trails and dirt roads that dot the desert landscape. We'll hit the open highway, traveling north of San Jose del Cabo, to the small town of Miraflores, where we'll take a rest stop. Back on the trail, we'll have fun crossing rivers and admiring the unique flora and fauna of the area as we make our way to the isolated oasis of Santiago, a beautiful and colorful town where we'll visit one of Cabo's oldest missions. On the road again, we'll 4x4 our way to the untamed wilderness of Fox Canyon, where we'll exit the Jeeps and take a short nature walk where your guide will share with you the natural wonders of the Baja. The walk culminates at a beautiful waterfall, where we can cool off with a swim in the pool below and relax. When we're ready to continue the tour, we'll drive back to San Jose del Cabo and finish things off with a delicious lunch and refreshments at Baja Brewing, Cabo's first brewery, set in the town's famed historic art district. A real Baja exploration! Cruise Passengers: This tour makes a great cruise shore excursion. Pick-up and drop-off from pier is included! Daily at 9:15 AM. Exact pick-up time depends on your hotel location or cruise ship schedule. Hotel and Cruise Ship Pickup and Dropoff, English-Speaking Tour Guide, Park Entrance Fees, 4x4 Jeep Wrangler, Lunch at Baja Brewing in San Jose del Cabo, Refreshments and Snacks. Extra money for Beer or Souvenirs.